Many businesses might find their way onto your website but they’re not always convinced to stay, regardless of your contents quality. In fact, only 5% of those browsers will make contact with you. How depressing. That’s why you need to have the advantage over your competitors if you want to succeed in making sales. OnMonitoring is a lead generation B2B tool that allows you to see what businesses have been browsing your website and where they got lost in its contents. OnMonitoring has two leading benefits. The first is sales. It will help your business obtain highly targeted leads.They do this by providing contact information for the companies that have been browsing your website. The second is marketing. Your conversion rate of browsers to customers goes up. You will start to see a better return in your investment from your website and marketing campaigns. From this information, you can move forward when you make contact with the businesses that have been browsing your site. You can do this by either making a quick call or by dropping them an email. 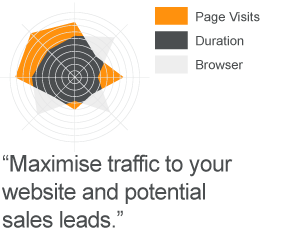 If you’re struggling to find the right words to seal the deal, look at our Email Marketing to include in your OnMonitoring package. See better results today with the use of OnMonitoring. Contact MediaHeads today on 03333 44 77 55 or write us some mail through enquiries@mediaheads.co.uk.